Embrace contemporary designs inside and outside the structure with Vanilla Oro marble tiles. These luxurious tiles have a white to ivory predominant color that’s tinted with touches of grey. They may also have gold and yellow veining adding interest to the tile. They’re the perfect choice for contemporary designs and are a must-have for any contractor working on high-end projects. Marbles tiles aren’t just for interior use. They can also be used in the exterior landscape as stepping stones. Nestled into the ground, they will shine and add a wonderful contrast through both texture and color. They can also be settled in among gravel for a modern entrance that makes a powerful statement. The marble tiles can also be used in outdoor kitchens, as backsplashes for outdoor cooking areas and even around open patios. Modern art features patterns and colors, and you can work this into any custom dream home. While Vanilla Oro tiles make a statement by themselves, they can leave a more powerful mark on any room by combining them with other tiles to form an impressive pattern. Use rectangular gray tiles that pick up the highlighting shades in the marble to form a woven pattern on the flooring. The rectangular tiles will weave across the open space represented by the luxurious marble. The moving lines will trick the eye and make your customers look twice at the floor. They’ll be impressed with the pattern and your creativity. You can also use this same pattern on shower walls, kitchen backsplashes and other areas that need more visual interest. The only limit to the patterns you can form is your own creativity. Mix the Vanilla Oro marble tiles with blue, gray, black, or even brown tiles to form checkerboard patterns or create borders. The use of contrasting colors will pull more attention to the floor and ensure that people notice the beautiful marble. However, you can also create more subdued patterns by choosing colors that are closer together for a monochromatic look that’s still unique and welcoming. Vanilla Oro tiles are commonly used in modern décor because of their pure coloring and luxurious look. However, they aren’t just for modern designs. If you have clients who love the rustic but don’t want to feel like they’re stepped back in time, then you can use this marble to balance the equation. Use it on the countertop or kitchen backsplash to add a touch of the contemporary without changing the overall rustic feeling. Due to the weight, marble is usually used in horizontal applications like flooring and counters. However, you aren’t limited to laying the marble flat. You can also use it in vertical applications including backsplashes, shower walls, and fireplace surrounds. The marble will need a greater level of support, but it can easily be mounted on walls with the proper adhesive. It can become the perfect finishing touch to any room, and potential customers will love how elegant the space looks when white marble tiles grace the walls and reflect more light around the space. You can draw more attention to the marble by angling spot lights to reflect off the surface, or paint surrounding trim in a contrasting color to make it stand out more. In the powder room, finish off the shower with glass walls or doors to further highlight the marble and enlarge the room visually. If you’ve installed a relaxing whirlpool tub, use the marble tiles to finish off the apron in an elegant fashion. This is also a fantastic choice if the flooring in the bathroom is Vanilla Oro marble and you want the bathtub to blend as much as possible. As a designer, you shouldn’t be afraid to mix materials. Marble and wood have long been paired together in quality, elegant furnishings. Bring that same mixture to your customer’s home by adding marble counters over wood cabinets. Use a combination of marble and wood on the fireplace mantle. Even a very traditional home can benefit from the addition of sophisticated marble to keep the space feeling modern and attractive. Marble tiles create a clean look that’s appropriate for any room, and your customers are sure to love the upscale touches. Large marble tiles make a statement on the floor, but smaller Vanilla Oro tiles can become perfect accents in the most delicate. 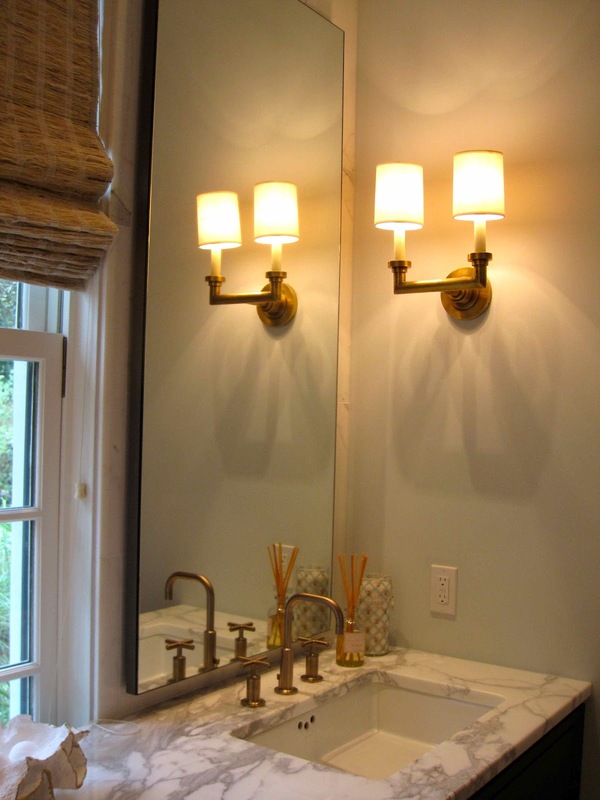 Tie everything together in the bathroom by using marble tile as a border for the mirror. Install marble tiles behind the stove for easy cleaning. Put a row of marble above the fireplace mantle to highlight the marble hearth below. There are countless ways to incorporate marble into your design plans, and they’ll all make a great impression on your clients. The beauty of marble is that it works with every design theme. Found in ancient Greek temples, it has a traditional feeling that your customers will appreciate. The true colors and light reflection also make it ideal for modern décor that focuses on clean lines and simple patterns. Marble can fit with traditional houses, modern lofts and everything in between. It’s an upscale option that people recognize and appreciate, and it will help you make a great impression on new clients. Once you start working with Vanilla Oro, you’ll find that the options are truly unlimited. You’ll start working it into more and more projects as you discover how much customers appreciate the look and adore the luxurious feeling. It’s important to work with a supplier that can send you bulk orders whenever you need to replenish your stock. Nalboor Tiles proudly maintain the most stable inventories and attractive prices. With our help, you can be confident that the tiles you need will be available for re-order whenever you start to run low.Whether you’re a home builder or interior designer, consider adding Vanilla Oro tiles to your custom plans. Your clients will love the look, and you’ll discover that it’s one of the most versatile marble options available. Available from Nalboor, professional marble wholesaler in Florida, marble tiles can help set you apart from the competition. Contact us today to learn more about our available stock and place your order for attractive Vanilla Oro marble tiles.